Léon Cogniet (1794–1880), The Abduction of Rebecca by Brian de Bois-Guilbert (study) (c 1828), watercolor and graphite on white wove paper, 23.2 x 30.3 cm, Bowdoin College Museum of Art (Museum Purchase, Lloyd O. and Marjorie Strong Coulter Fund), Brunswick, Maine. Courtesy of Bowdoin College Museum of Art. Most narrative painters make their mark by their paintings, but a few are both brilliant in painting stories, and highly influential teachers. Léon Cogniet (1794–1880) is probably the best example of the latter. He enrolled in the École des Beaux-Arts in Paris in 1812, when he was just eighteen years old. Within three years, he was producing major history paintings. He competed unsuccessfully for the Prix de Rome in 1816, but the following year won it, with Achille Michallon and Antoine Garnaud. He remained at the French Academy in Rome until 1822, by which time he had already established his reputation at the Salon in Paris. From 1840, he concentrated more on teaching, including at a popular painting workshop for women, which was run by his sister. In 1851 he was appointed a professor at the École des Beaux-Arts in Paris, and soon stopped painting altogether. Among his more famous students were Rosa Bonheur, Jean-Paul Laurens, Jules Lefebvre, and Meissonier. He retired in 1863, and died a forgotten recluse. Léon Cogniet (1794–1880), Briseis Restored to Achilles in his Tent Discovers the Body of Patroculus (1815), oil on canvas, dimensions not known, Musée des Beaux-Arts, Orléans, France. By VladoubidoOo, via Wikimedia Commons. 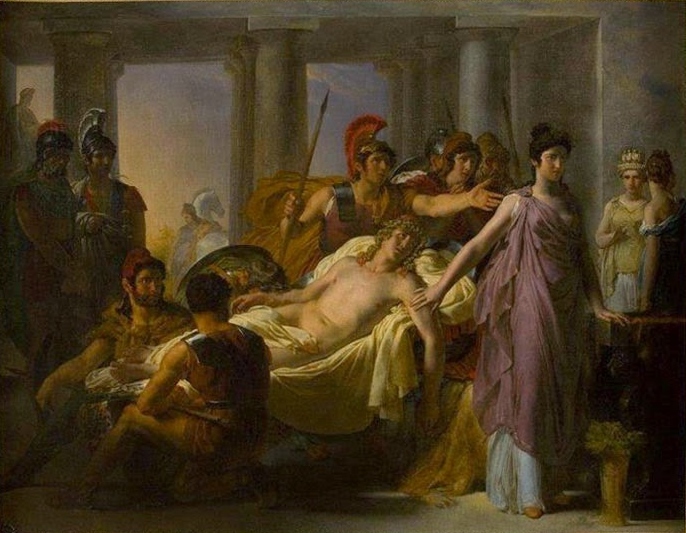 Briseis Restored to Achilles in his Tent Discovers the Body of Patroculus (1815) is among Cogniet’s earliest surviving paintings. It tells the story of Briseis, a legendary and beautiful queen of Lyrnessus at the time of the Trojan War. When Achilles led an attack on her city, which was near Troy, she was captured and the rest of her family were killed by Achilles. Briseis was made concubine to Achilles as a reward. Achilles’ great friend Patroclus comforted her, and promised to have Achilles make her his wife when the war ended. In the first book of Homer’s Iliad, Agamemnon demanded Briseis in compensation for giving up his own concubine. Agamemnon and Achilles quarrelled, Briseis was given to Agamemnon, and Achilles withdrew from battle, with disastrous results for the Greeks. When Patroclus was killed in battle, Briseis was restored to Achilles, and he returned to the fight, to avenge the death of Patroclus. 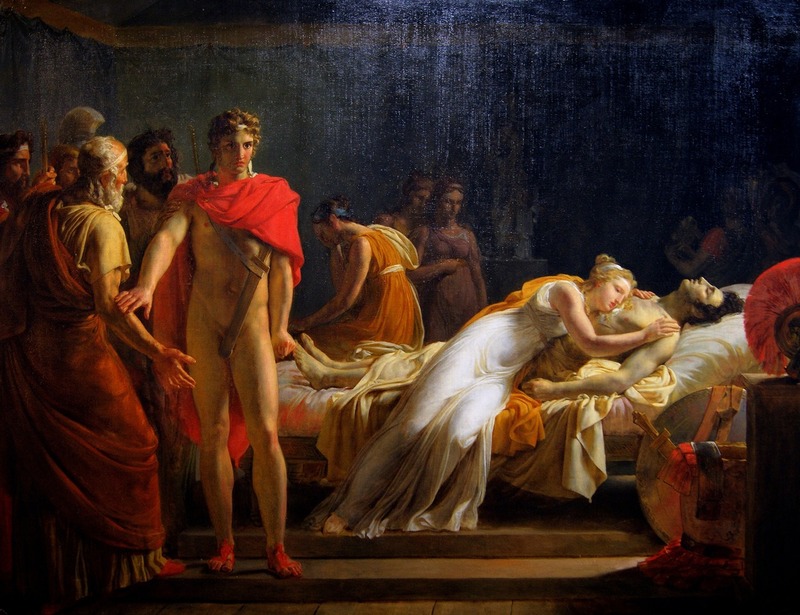 The young Cogniet – only 20 at the time – shows the beautiful Briseis grieving on Patroclus’ corpse. Achilles has been galvanised into action, a fearsome stare in his eyes. This dramatic effect is heightened by Cogniet’s depiction of the red light reflected from the robes at the left. 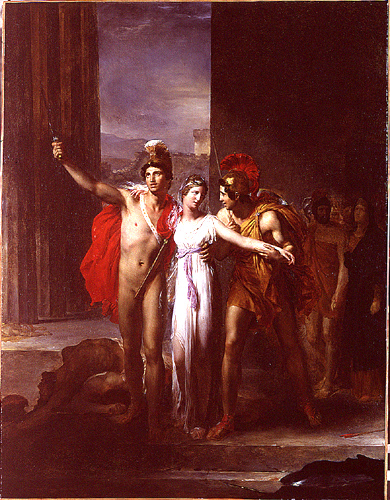 Oenone Refuses to Rescue Paris at the Siege of Troy (1816) was probably Cogniet’s first and unsuccessful submission for the coveted Prix de Rome. Oenone was the first wife of Paris of Troy, the son of King Priam. Paris abandoned her when he went off to kidnap Helen from Sparta, leading Oenone to predict the Trojan War. She also sent their son, Corythus, to assist the Greeks to Troy. Quintus Smyrnaeus’ Posthomerica, which supplements and elaborates the Homeric account of the Trojan War, tells that Paris returned to Oenone when he was wounded by Philoctetes’ poisoned arrow, to beg her to heal him using her herbal arts. Oenone refused, leaving Paris to return to Helen, and die. Oenone was then overcome with remorse, throwing herself onto his funeral pyre. Cogniet shows the dying Paris, surrounded by warrior colleagues and looking imploringly towards Oenone, her back turned on him as she walks away. At the right edge, wearing a golden crown, is her successor, Queen Helen. It was Cogniet’s Helen Delivered by Castor and Pollux (1817) which secured him the Prix de Rome. Castor and Pollux, together known as the Dioskuri, were mythical twin brothers, whose mother was Leda. Castor was the mortal son of the King of Sparta, while Pollux was the divine son of Zeus, conceived following his seduction of Leda, when he assumed the form of a swan (depicted extensively in paintings of Leda and the Swan). Also resulting from Zeus’ seduction of Leda (through obscure biological mechanisms!) was Castor and Pollux’s sister Helen of Sparta, then Helen of Troy. When Helen was abducted by Theseus, Castor and Pollux invaded his kingdom of Attica and rescued Helen from him. To avenge that abduction, they took Theseus’s mother, Aethra, who was made a slave to Helen back in Sparta, until she was released after the fall of Troy. Cogniet paints this rather simpler story in plain terms. Castor and Pollux are shown either side of Helen, celebrating their success. The twin on the left wears a red cloak similar to that of Achilles in Briseis Restored to Achilles…, and the scabbard of his sword is used for the same pictorial purpose. Léon Cogniet (1794–1880), Self-portrait in his Room at the Villa Medici (1817), oil on canvas, 44.5 × 37 cm, Cleveland Museum of Art, Cleveland, Ohio. Wikimedia Commons. Once in Rome, Cogniet painted the insightful Self-portrait in his Room at the Villa Medici (1817). 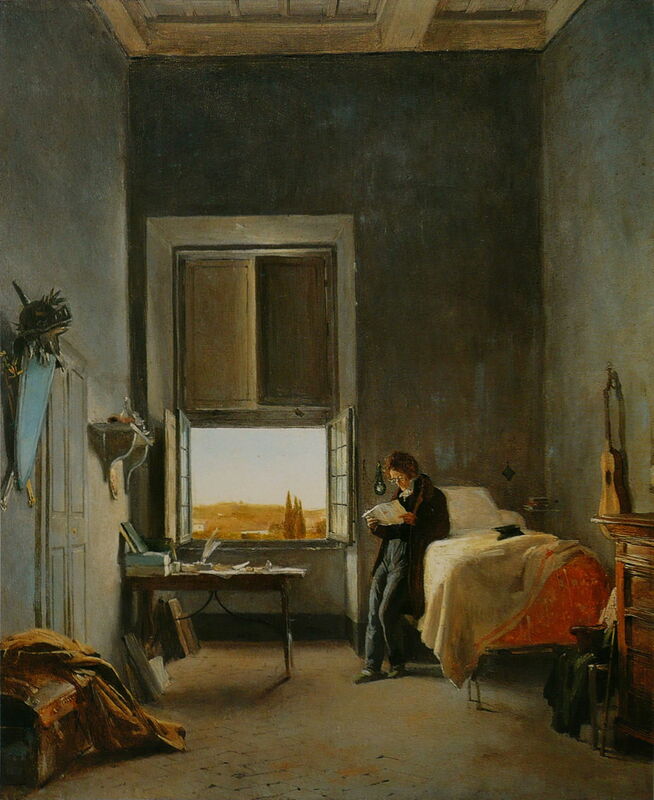 Small within the empty space of that room, he leans against the bed, next to what amounts to a painting within the painting, showing the Roman campagna outside. Léon Cogniet (1794–1880), The Battle of Heliopolis (date not known), further details not known. Wikimedia Commons. 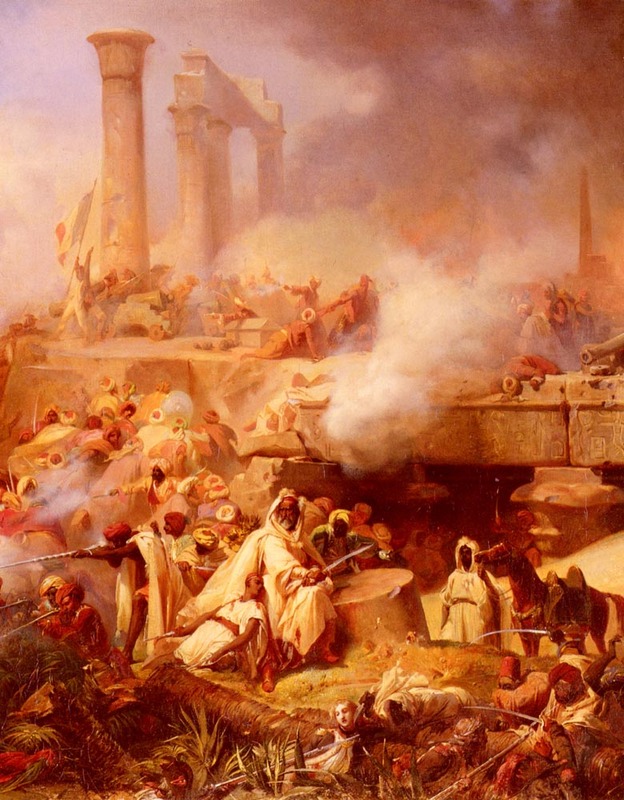 The Battle of Heliopolis (date not known) is a scene during the second battle of Heliopolis in 1800. One of the battles in the French Revolutionary Wars, it resulted from negotiations by the French General Kléber to withdraw the remains of his forces from Egypt so that they could take part in the war in Europe. These produced a convention, of El Arich, which would have allowed such a withdrawal, but the other parties, Ottoman and British, were too divided to bide by it. General Kléber started fighting again. Because the Ottomans considered the French too weak to put up any effective resistance, they marched on Cairo. 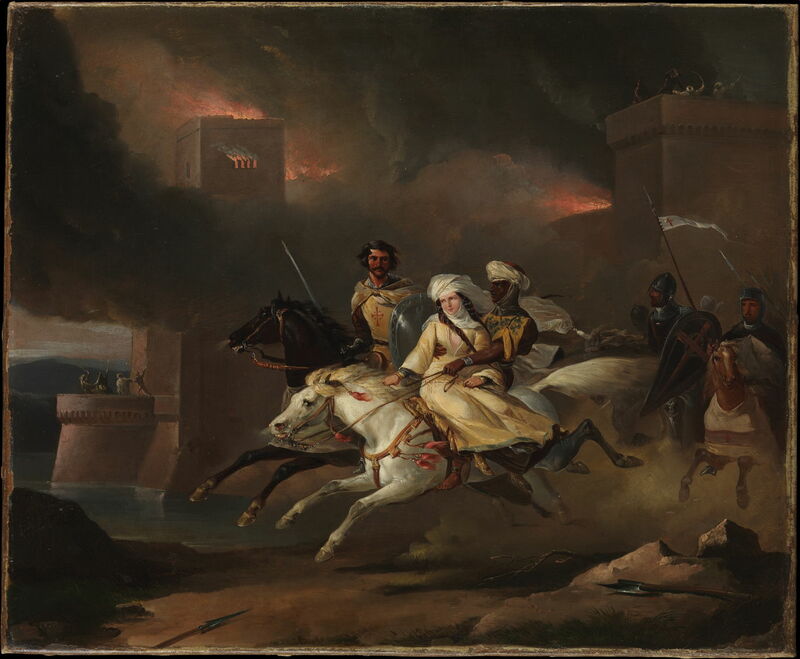 However, outnumbered as he was, General Kléber attacked the Ottoman army at Heliopolis, achieved a decisive victory on 20 March 1800 with few casualties, and re-entered Cairo to suppress its revolt. Heliopolis is now an inner suburb of Cairo. Cogniet interestingly shows the French tricolore flag, adopted in its current form in 1794, flying at the far left, close to a column. At the right side is the most prominent ancient monument in Heliopolis, the Al-Masalla Obelisk. Léon Cogniet (1794–1880), The Massacre of the Innocents (1824), oil on canvas, 265 x 235 cm, Musée des Beaux-Arts, Rennes, France. The Athenaeum. Often claimed to be Cogniet’s greatest painting, The Massacre of the Innocents (1824) is based on the account in the Gospel of Matthew (chapter 2) of the execution of all young male children born near Bethlehem, ordered by Herod the Great in his bid to eliminate any future pretender to be the King of the Jews. 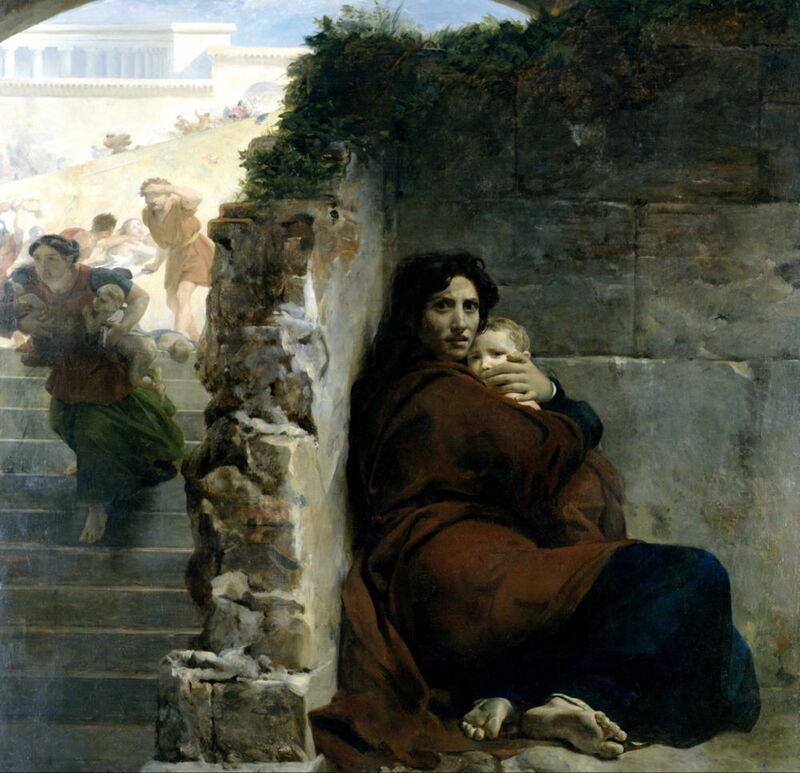 As mothers clutching infants under their arms flee from Herod’s troops, Cogniet makes their terror very personal in the close-up of one mother, whose arms are wrapped around her baby son, the fingers of her left hand stifling any cries he might make. She looks straight at the viewer, her face frozen in abject fear, as she tries to hide in an obscure corner. 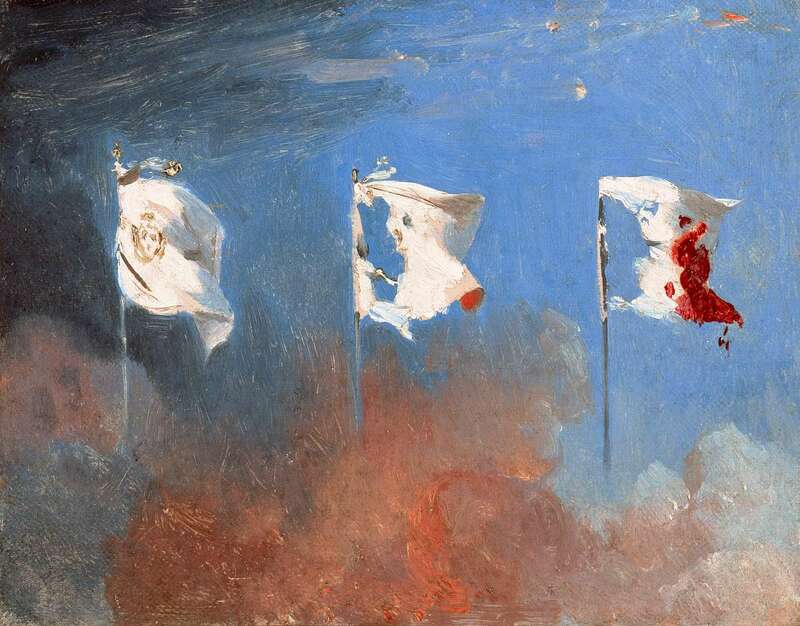 Léon Cogniet (1794–1880), July 1830, or The Flags (study) (1830), oil on canvas, dimensions not known, Musée des Beaux-Arts, Orléans, France. Wikimedia Commons. However I think that Cogniet’s July 1830, or The Flags (study) (1830) ranks as one of the less known gems of the century. The current tricolore had been officially adopted as the French national flag in 1794, but then fell into disuse. 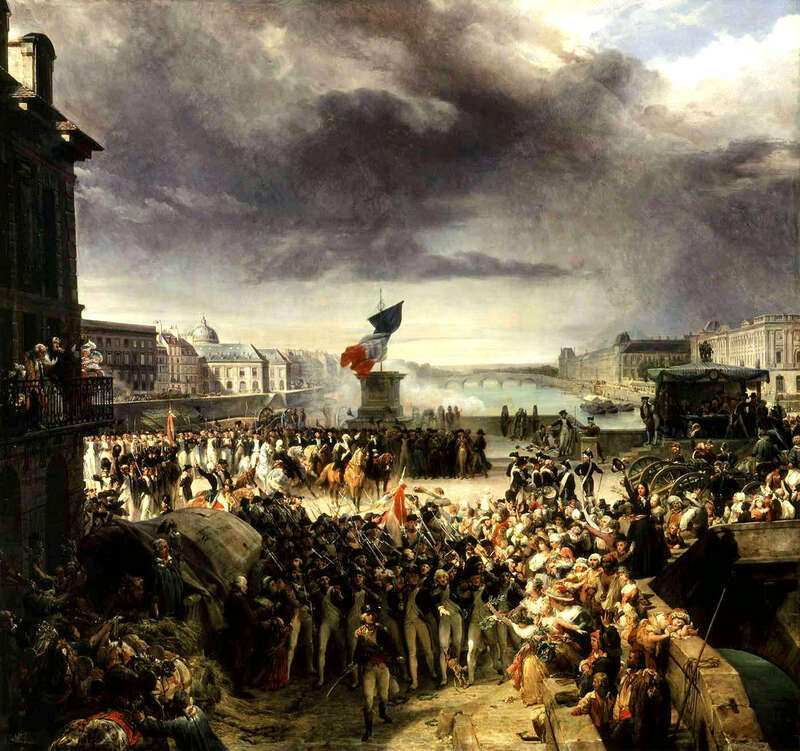 Cogniet’s rough brushstrokes here show the transformation of the white flag of the French monarchy into the tricolore, in its violent restoration of the July Revolution of 1830 by King Louis-Philippe. 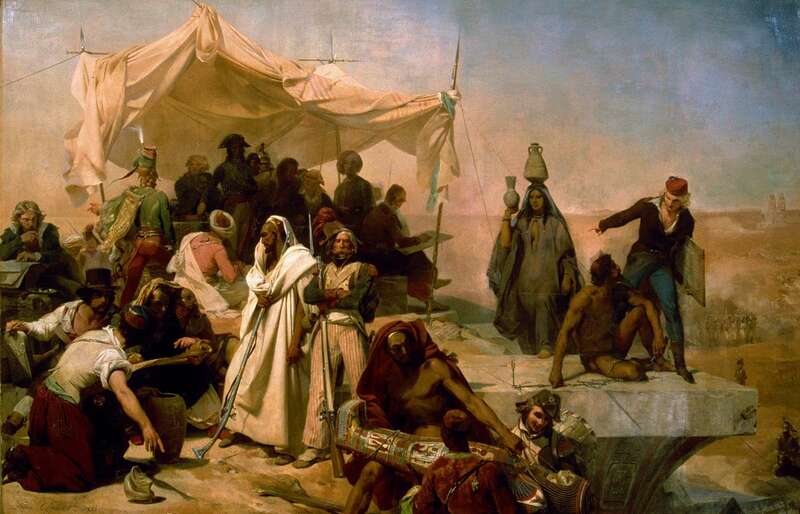 Léon Cogniet (1794–1880), Bonaparte’s 1798 Egyptian Expedition (1835), ?fresco ceiling, dimensions not known, Musée du Louvre, Paris. Wikimedia Commons. Cogniet was also called to document Napoleon’s empire, painting his Bonaparte’s 1798 Egyptian Expedition (1835) on a ceiling in the Louvre Palace, as an explanation of how so many Egyptian artefacts come to be in Paris – ironically now on display in that same building. Léon Cogniet (1794–1880), The Paris National Guard on its way to the Army, September 1792 (1836), oil on canvas, 76 × 189 cm, Château de Versailles, Versailles, France. Wikimedia Commons. Among these later narrative paintings, his The Paris National Guard on its way to the Army, September 1792 (1836) is an elaborate visualisation of momentous events of the French Revolutionary Wars. France had declared war on Austria in April 1792, following which Prussia joined Austria, and its army invaded France. Thanks to augmentation from the National Guard, the French were able to defeat the Prussians at the Battle of Valmy, and forced their withdrawal. Two different versions of the tricolore are shown: that held aloft from the group of soldiers in the foreground has the prevailing order used during the First Republic, and the reverse of that adopted in 1794 and still used today. The flag flying in the centre of this painting appears anachronistic, adopting the later reversed order. Cogniet greatly enjoyed reading Sir Walter Scott’s romantic mediaeval novel Ivanhoe, which was first published in English in 1820, and appeared in French translation soon afterwards. Ivanhoe is a swashbuckling story of one of the remaining Saxon noble families in the predominantly Norman court of 1194, after the failure of the Third Crusade. Sir Wilfred of Ivanhoe, the hero, is opposed by Sir Brian de Bois-Guilbert, one of the Norman Knights Templar. Isaac of York is a Jewish moneylender with a beautiful daughter, Rebecca. At the siege of Torquilstone Castle by the Black Knight (King Richard), Robin of Locksley (Robin Hood), and their Saxon forces, Rebecca is abducted by Brian de Bois-Guilbert. Meanwhile Ulrica, an old Saxon woman, sets fire to the castle, and revels in her vengeance on top of its tower. The Abduction of Rebecca by Brian de Bois-Guilbert (c 1828) is a slightly smaller late watercolour study for Cogniet’s finished oil painting. Set in daylight, it shows Brian de Bois-Guilbert, Rebecca, and Bois-Guilbert’s Saracen slave in the foreground. As their horses gallop away, the castle behind them is consumed by fire, with Ulrica’s figure seen on the top of the tallest tower. Léon Cogniet (1794–1880), The Abduction of Rebecca by a Knight Templar (c 1828), oil on canvas, 32.7 x 39.7 cm, The Metropolitan Museum of Art (The Whitney Collection, Promised Gift of Wheelock Whitney III, and Purchase, Gift of Mr. and Mrs. Charles S. McVeigh, by exchange, 2003), New York, NY. Courtesy of The Metropolitan Museum of Art. Cogniet then painted a finished oil version, which was exhibited in the Salon in 1831, and is now in the Wallace Collection in London. This reduced size version, The Abduction of Rebecca by a Knight Templar (c 1828), was almost certainly a copy made by Cogniet himself. There are small differences between the two oil paintings, this version not showing Ulrica on the tower, for example. Cogniet was not the only prominent French painter who had fallen under the romantic influence of Ivanhoe. Just four years younger than him, Eugène Delacroix was already courting controversy in the Salon when Cogniet painted The Abduction of Rebecca. 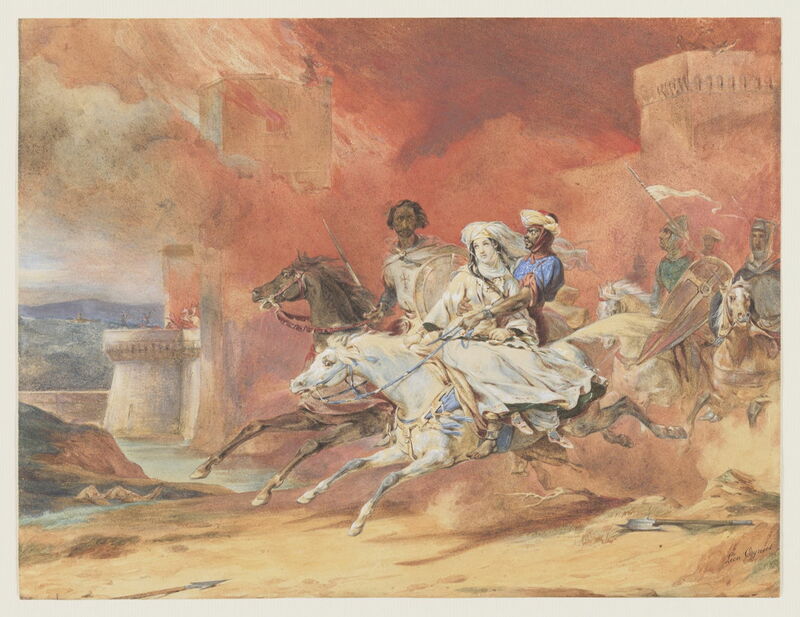 Delacroix made lithographs illustrating the works of Scott, and in 1846 turned this same scene from Ivanhoe into one of his greatest paintings. Eugène Delacroix (1798–1863), The Abduction of Rebecca (1846), oil on canvas, 100.3 x 81.9 cm, The Metropolitan Museum of Art (Catharine Lorillard Wolfe Collection, Wolfe Fund, 1903), New York, NY. Courtesy of The Metropolitan Museum of Art. 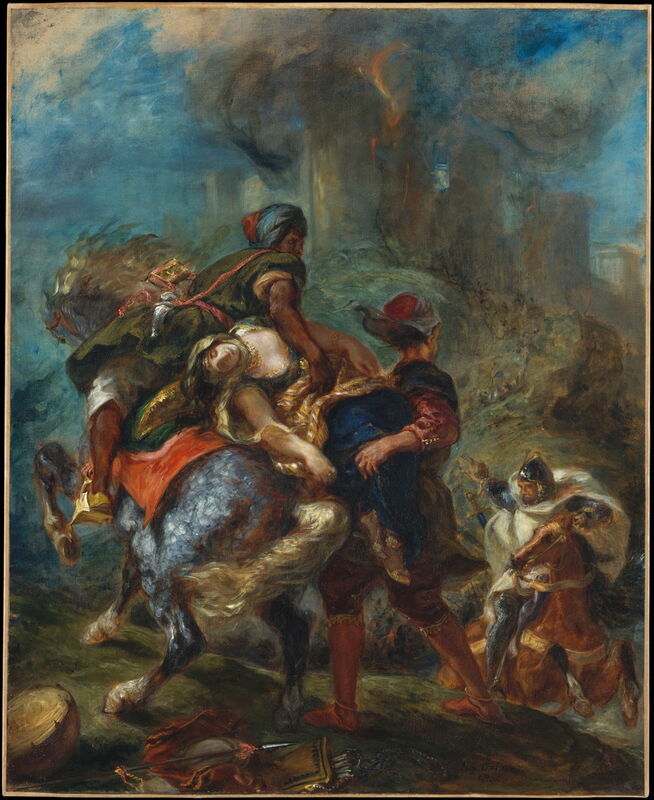 Eugène Delacroix’s The Abduction of Rebecca was shown at the Salon of 1846 under the extended title of Rebecca Abducted at the Order of the Templar Bois-Guilbert during the Sack of the Castle of Front-de-Boeuf, but did not get a good critical reception. In 1858, Delacroix attempted an entirely different composition, which was shown in his final Salon the following year, and is now in the Louvre. Posted in General, Painting and tagged Cogniet, Delacroix, Ivanhoe, narrative, painting, Scott. Bookmark the permalink.